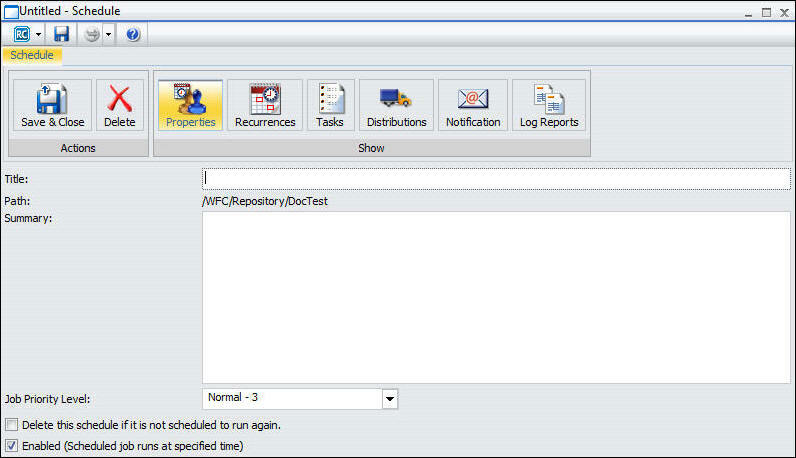 The Basic Scheduling tool provides the ability to create a schedule for a procedure (FEX) from the tree when a report procedure (FEX) is selected from the BI Portal, Dashboard, and Developer Studio. The WebFOCUS	Client security authorization model controls whether users are authorized to access the application content stored in the Repository and the Scheduling tools. For information on the Client authorization security model and ReportCaster operations, see the WebFOCUS Security and Administration manual. To create a new schedule for a report procedure (FEX), navigate to the tree and expand a folder to display your report procedures (FEX). Right-click the report procedure (FEX) you want to schedule, select Schedule, and then select the method to distribute the report procedure (FEX). You can distribute the report procedure (FEX) by Email, FTP, Printer, Report Library, or Managed Reporting, as shown in the following image. The following image shows the Basic Scheduling tool that consists of a Quick Access Toolbar and the ribbon from which you access the schedule options. The Quick Access Toolbar, located at the top of the Basic Scheduling tool, is always visible no matter which options are selected. It provides access to the most commonly used functions. From the Quick Access Toolbar, you can select the ReportCaster	button to access the New Distribution List, Save, Save As, Delete, and Close options. You can also access the Save, Run, and Help options from the toolbar, as shown in the following image. Run options are available for selection from the Run drop-down list. Note: The schedule must be saved for Run options to be available or enabled. The Run options you can select include: Run with default traces, Run with no traces, Run with Schedule traces, and Run with Schedule and Report traces, as shown in the following image. Note: Online help is available my clicking the online help icon. The Actions portion of the ribbon is shown in the following image. Save & Close. Saves and closes the schedule. Delete. Deletes the schedule and closes the Scheduling tool. The Show portion of the ribbon is shown in the following image. The Delete this schedule if it is not scheduled to run again check box specifies to delete the schedule if, after it is run, it is not scheduled to run again. The Enabled (Scheduled job runs at specified time) check box specifies to run the schedule as specified by the Recurrence settings within the schedule. Recurrences. Provides run-time intervals for distribution and repeat options. Provides the facility to Manage Recurrences (New, Edit, and Remove). Tasks. Provides information on the report procedure (FEX) that is being scheduled. The Advanced Scheduling tool also provides options to create and delete tasks. Provides the facility to Manage Tasks (New, Edit, and Remove). Distributions. Provides options to specify the recipients or location to which the report will be distributed. Notification. Provides the options to set up notification of the schedule status. Log Reports. Shows the Number of Jobs and the Log Report for individual jobs.